"Acrobats in the studio closeup"
Image of the sculpture Acrobats on the campus of the University of Northern Iowa in Cedar Falls, Iowa. 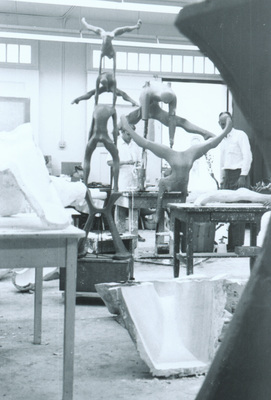 The sculpture by Edward Whiting was installed in the Redeker Complex courtyard in 1965. The medium is fiberglass and epoxy resin. "Acrobats in the studio closeup" (2019). Art on Campus Photographs. 110.